Chris Fernandez, a student at Binghamton University in New York, is officially the winner of the 2011 Excellence Awards Scholarship from eCampus.com!!! Chris beat out over 400 applicants for the title and the $2,000 scholarship! Chris is a freshman studying Electrical Engineering at Binghamton. Some of Chris’ achievements include: completing the rank of Eagle Scout through the Boy Scouts of America (serving as the Senior Patrol Leader of his troop for a year); planned, organized and lead a landscaping project and flowerbed installation at a new elementary school playground; four time High School All-American in track; maintained a 3.5 gpa in his first semester as an electrical engineering student at Binghamton; and ran a freshman school record for the 800-meter distance in track at his university. Chris’ application included a summary of the affect this scholarship would have on his life: “Receiving this scholarship would help my family afford to keep me in school. As the oldest of four children, this scholarship would help relieve some of the financial strain my education has on the rest of my family. I plan on continuing my pursuit of excellence through the rest of my collegiate career and later into the workforce,” said Chris. The rest of the Top 5 included Angel Cadena Jr., a student at Southern Connecticut State University; Ashley Carr, a student at Indiana University Bloomington; Alexis Smith, a student at Lee University, and Lauren Delpont, a student at Transylvania University. All of the candidates received a combined total of 1,392 votes from their friends and family on Facebook. Fernandez won the Award with 491 votes. The 4 runners-up all received a $250 gift card to eCampus.com for future textbook purchases. Thanks to all of you who voted, and stay tuned for the next chance to win BIG from eCampus.com! Keep up the hard work! And congratulations to Chris Fernandez!!! It’s that time of year again. Finals are just around the corner and summer is so close you can probably smell it! Well, to reward all the hard-working students out there, eCampus.com is announcing its first annualeCampus.com Excellence Award! The award is set up like a contest, which will began March 31st. Basically, we’re on the hunt for the most EXCELLENT current full-time college student in America! To apply you must be active in your school and local community, demonstrate a strong work ethic, exhibit outstanding leadership skills, possess great teamwork capabilities, and a desire to succeed. Even if you don’t fit all those categories, apply anyway! We are going to pick the top 5 candidates from all of the AWESOME applicants we receive based on their story and then let YOU pick the most EXCELLENT student out of the bunch! The application period ends April 22nd at midnight. From there, the wonderful folks over at eCampus.com will choose the Top 5 Candidates. On April 25th, online voting will begin to pick the winner out of the Top 5. Anyone (including the Top 5 Candidates themselves) will be able to go online and vote for who they think deserves the eCampus.com Excellence Award (one vote per person though, this isn’t American Idol)!!! Voting will end May 9th at midnight and the winners will be announced that afternoon! Now for the best part: The grand prize winner will receive a $2,000 scholarship from eCampus.com (woohoo)! 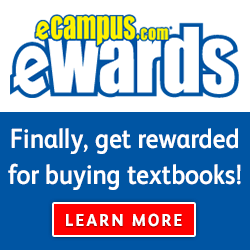 Along with the scholarship, the winning student’s university will also receive 30% extra buyback credit for all students with an active email address for that university when selling textbooks back to eCampus.com through 2011. What about the rest of the Top 5, you ask? They’re in luck too! The four runners-up will each receive a $250 gift certificate from eCampus.com (to be used on textbooks, dvds, college gear, etc.)! How ya like them apples? Pretty sweet deal if you ask me! So hurry and head to eCampus.com to submit yourself for the eCampus.com Excellence Award and tell all your EXCELLENT friends about it as well! And be sure to check back here for updates throughout the duration of the contest! We are proud to announce that in the last week, eCampus Blog was selected by eCollegeFinder.org as a Top 50 Freshman Advisor blog. The Freshmen Advisor Award recognizes the top 50 Internet-based resources offering young students advice toward advancing their college-life experience. By introducing students as well as parents to both the exciting and challenging trials and tribulations of beginning college eCampusBlog.com has shown its commitment to college freshmen during their transition into higher education. The Freshmen Advisor Award commends eCampusBlog.com’s guidance for young students, highlighting the myriad of opportunities often available for students at their individual academic institutions and providing sound advice and suggestions. This award recognizes everything that our blog has been striving to do. The eCampus blog strives to provide college students with everything they might need to know. 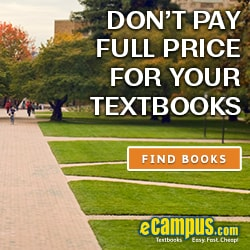 From study tips and where to find cheap textbooks, to cheap recipes and college sports, the eCampus blog is here to help. We are pleased to be recognized by eCollegeFinder.org, a fellow influential college blog and also to be ranked with 49 of the top “college help” blogs out there. Getting ahead in today’s competitive job market requires you to advance your education and knowledge. eCollegeFinder.org helps students find the right online degrees, offering a wide range of Bachelor’s, Master’s and PhD degrees as well as specialized certificates and diplomas from the top accredited online colleges and universities. Thanks to all of our readers for all your support!